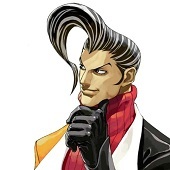 I chose Alex because he was my main when I started playing Street Fighter III: New Generation, although he became an alt as soon as I picked up playing Urien in 3rd Strike. 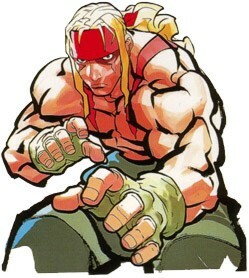 I enjoyed Alex as a character because I think his moves look awesome, even his normal attacks look like there’s a ton of power behind them. I used Photoshop and Manga Studio for this piece. I rarely do backgrounds so I thought it was important for me to challenge myself and…well, do a background! I’ve always wanted to draw Alex wearing his jacket from his ending because I thought it made him look Terry Bogard-ish from Mark of the Wolves and he certainly looks a lot less battle-ready with it on, he’s more casual looking. I depicted him on his day off from training or fighting, I’m sure he goes to the market once in a while like any normal person. He buys some ingredients to take home so Pauline can cook a meal or hell, maybe he cooks the food himself. He would be a scary looking guy to see on a subway train, I imagined him looking super-serious while holding onto his groceries and on the phone with Pauline letting her know he’s on his way home. 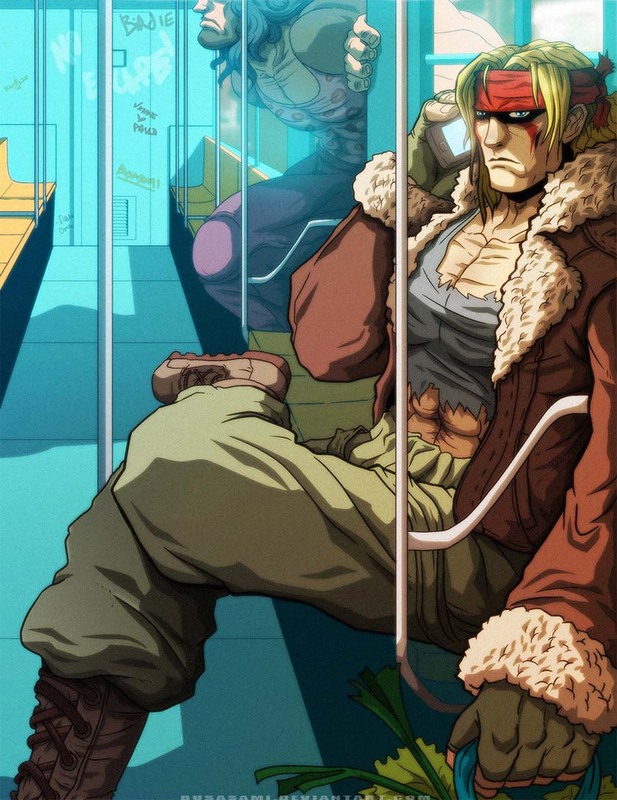 Hugo is inconspicuously boarding the train in the background, a sure sign of trouble for Alex as he has a rivalry with him in 3rd Strike.